With all those portable devices we know how annoying it is to run out of power. 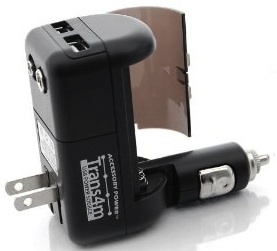 To make sure you can get power almost anywhere the Trans4m is the way to go. A dual port USB charger that can get power from a normal power socket, car lighter or AA or 9V batteries. That makes a great package for you travels as now you can get power anywhere. No running out of power cell phones any more. Go get your own Trans4m USB Charger.